Upon entering the courtyard of this beautifully preserved colonial building, you are instantly transported back to 19th-century Mexico. 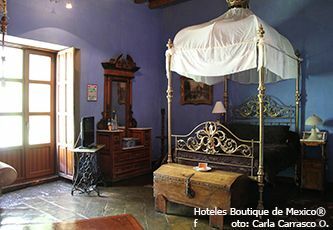 A unique hotel-antique gallery concept, the Mesón features guest rooms decorated with regional antiques for sale. Fantastic shopping aside, the hotel´s restaurant serves the finest traditional Pueblan cuisine imagineable. From the exterior, Mesón Sacristía de la Compañia looks like a simple colonial building with typical Spanish terraces and heavy wooden doors. Once you enter its courtyard, you are instantly transported back to 19th-century Mexico. The decor is a combination of beautifully preserved colonial antiques and rustic furniture. The traditional Talavera pottery of the area is used along with exquisite gold-leaf detailing around the door frames. 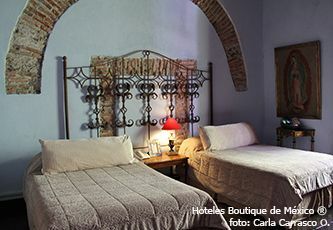 Each room at Mesón Sacristía de la Compañia is uniquely decorated in antiques, and if you like what you see, you can buy the whole ensemble and take it home! How so? For generations the Espinosa family has sold antiques in the Los Sapos area of downtown Puebla. There´s even an antique gallery that features anything from furniture and tapestry to figurines and religious art. Their award-winning cuisine of traditional Pueblan dishes is served in the courtyard with patio-style seating and live music daily. 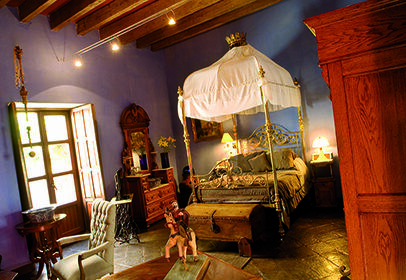 Experience colonial Mexico at its best and be pampered with exemplary service in Puebla. The city of Puebla has much to offer and should be visited. Neighboring Cholula is equally enticing and certainly the perfect combination for a well-rounded visit of the area and its intriguing history. Almost all items that are used to decorate the guest rooms are for sale. This is not only a hotel but also a live showroom. That Mexico City and Oaxaca can be reached by first-class bus (and it really is!) in under a few hours. Mesones Sacristia de la Compañía´s popular restaurant features live music from 9:30 - 11:30 pm on Friday and Saturday nights. Guestrooms are located above this area so it may be a bit noisy for early sleepers that choose not to partake in this activity. Please also note that the restaurant closes at 6pm on Sunday nights and alternate plans should be made for dinner. The hotel staff can happily assist you in finding the perfect alternative. The owners will be opening Sacristía de Fray Juan, what promises to be Puebla's most cutting-edge hotel, in May 2012. Stay tuned. 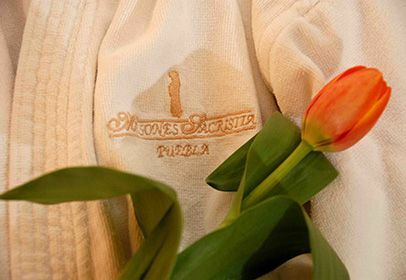 The location, the cuisine, the decor and the unsurpassed hospitality. This is authentic Puebla at its finest! 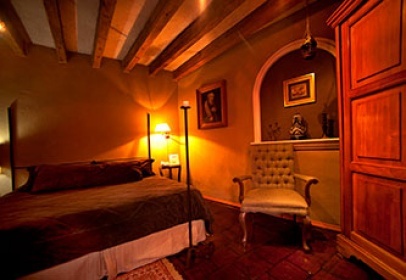 Foodies and antiquarians will adore Puebla and more so, this charming hotel which specializes in wonderful pueblan cuisine classes and mexican antiques. 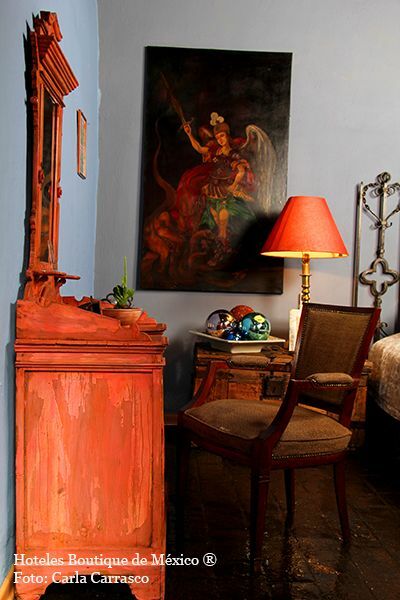 All suites are unique in layout and size and are beautifully decorated with antique furnishings. All have private bathroom, telephone, cable TV, coffee maker, alarm clock, hairdryer and iron. Standard room with one King bed. Beautifully decorated with antique furnishings. Standard room with two double beds. All are uniquely decorated with antique furnishings, most of which are for sale. Private bathroom, telephone, cable TV, coffee maker, a alarm clock, hairdryer and iron. Beautifully decorated suite with antique furnishings. One king-size bed and a small sitting area. Stays of less than seven days: No penalty will be charged for cancellations received 48 hours or more prior to arrival date. Cancellations received 24 hours prior to arrival date will be charged 50% of the normal rate for one night, less than 24 hours prior will be charged the normal rate for one night. Stays of seven days or more and groups: No penalty will be charged for cancellations received seven days or more prior to arrival date. Cancellations received less than seven days prior to arrival date will be charged 30% of the entire stay. No-shows will be charged one night. 16% tax. Welcome platter of regional sweets. Daily a la carte breakfast for two. Daily newspaper. Parking. Car wash.
Children under 12 at no charge; maximum two children sharing parents room. Transportation from Huejotzingo Airport and Mexico City airport with previous notice and adittional cost. The trip is 30 minutes. Special one-night decoration with red roses and candles in your room. Special one-night decoration with petals and candles in your room. Traditional Pueblan cuisine served in a colorful bistro-style courtyard. Provides soothing afternoon piano and live music every night except Sundays.